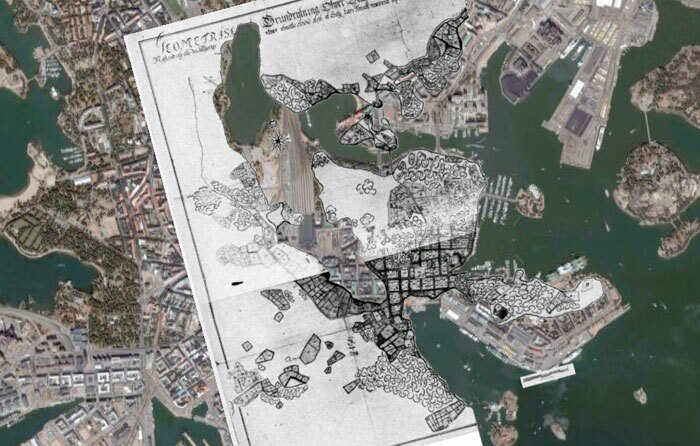 central helsinki in 1701 was a lot different to what it is now, kluuvilahti (gloviken, kluuvi bay) stretched down from töölönlahti towards aleksanterinkatu. the map above is 308years old and doesnt really match up perfectly with the satellite image in google earth – but its enough to show the differences. the old shoreline of kluuvilahti is remembered in the streetart piece kluuvinlahden fossiilit by tuula närhinen. ive been following the construction of the mt100 road project here in helsinki – a few times a week i take a bus that passed a big hole that in time will hold a tunnel. the tunnel is being built in segments to accommodate the need for regular traffic to still pass the very busy crossroads. the pdf documents on the tiehallinto website give lots of information but they lack a context to them. helsingin sanomat article (in finnish) about the ruskeasuo traffic changes. a motorcyclist was killed at the crossing on tuesday. this is hypnotising: helsinki live transport map. (currently for a few bus routes). click on the bus icons for more options – like time to next few stops, plus “follow bus” option. mmmm. some of the stuff in the new google earth version 4 beta makes my brain hurt. go get it now!